This quilt tutorial is for a finished throw size quilt, depending on a few factors such as the borders you choose to add, how accurate your sewing and cutting may be. The gray Sprinkles Quilt above measures approximately 58" x 70". The one used in this tutorial below measures 54" x 64". There will be a bit left over for a border. A jelly roll would make this part much quicker. 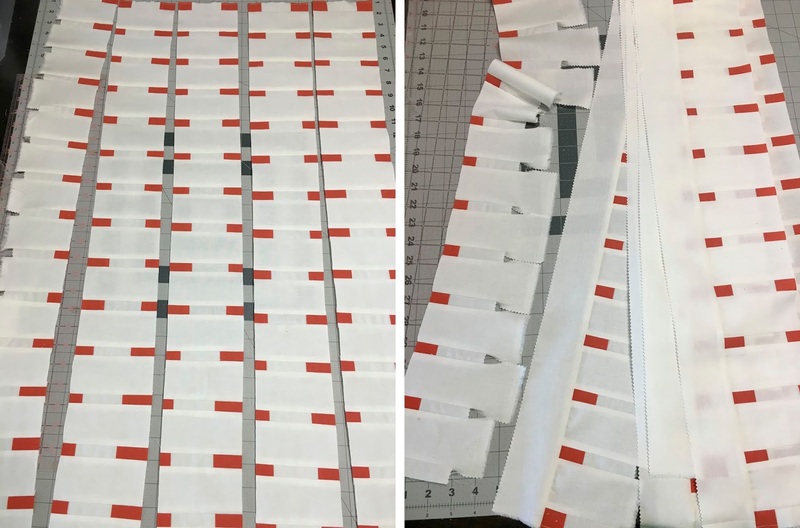 The "sprinkles" or Feature fabric strips will require much less fabric. Use a smaller stitch length such as 1.8 or 2.0. Sew with a 1/4" seam. Press the seams to the dark side. If using WOF strips, you will have 5 Feature fabric strips and 5 Background strips sewn together. Once they are sewn, you will need to cut the panel in half (see photo) so that each side measures about 21" wide and then sew these together for one long panel. If using the fat quarters, you will need to cut the Background WOF strips in half first, then sew all of the strips together. Add a Background strip to the last side. 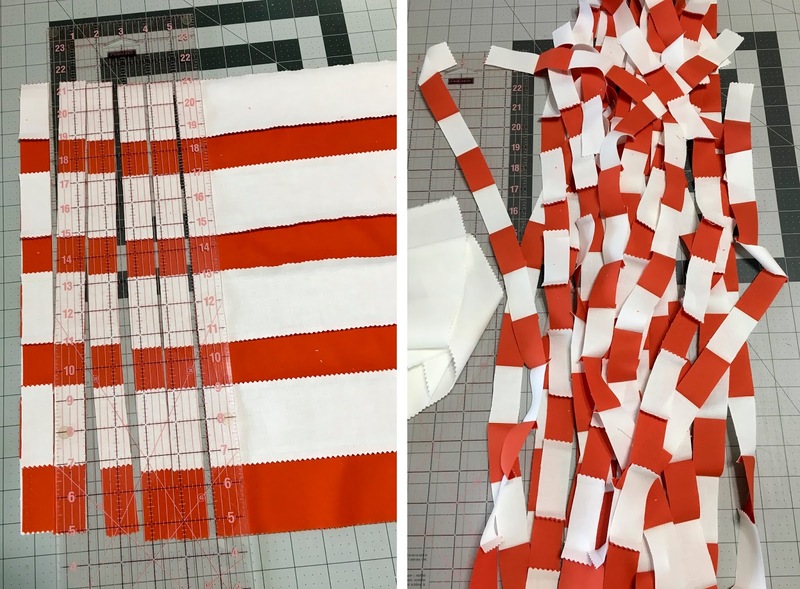 You will need a total of 21 strips sewn together, starting and ending with a Background strip. You will need to cut strips from this panel. It is easier to fold the panel in half, square up one side and then cut the 1" striped strips. You will need a total of (18) 1" striped strips from this panel. Be careful not to tug these strips apart by accident. 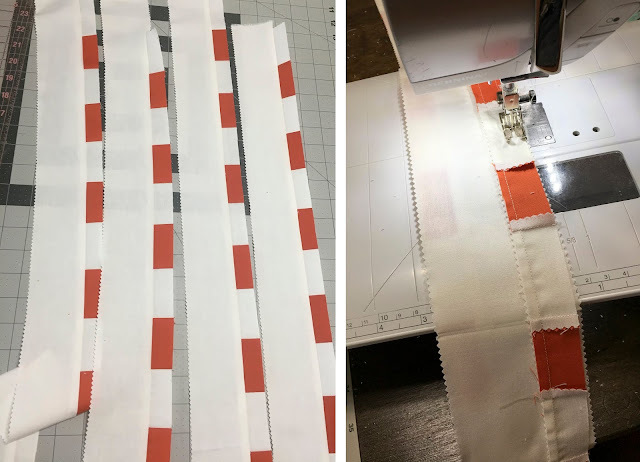 Sew the 1" striped strips you just cut with 2.5" x WOF Background strips. Do this 17 times, leaving (1) 1" striped strip leftover. Place the 1" striped strips on top (see photo). This will help speed up your sewing since you can see the seams as well as prevent warping when sewn. Press the seams away from the 1" inch strips. Note: In the photos below, you will notice I did not trim off the selvage edges of the background fabric. I eyeballed the placement, matching up the ends by sight but was okay with the variation in placement. You could trim off those ends at this point to better align the feature fabrics. Sew all the strips together, adding the leftover 1" striped strip to the last side so that both sides have the 1" striped strips on the edge. Lay out the panel and cut roughly in the middle of the feature fabric. 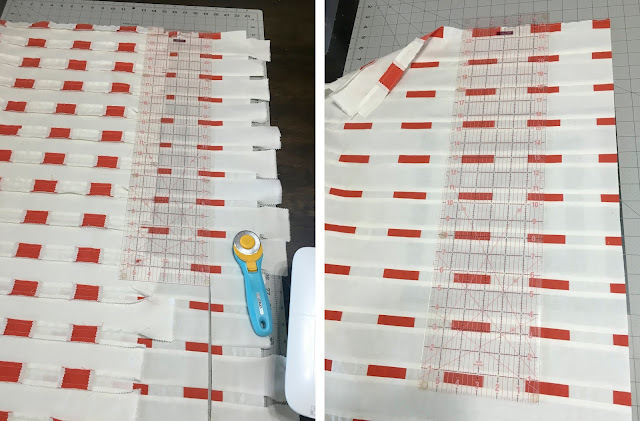 Since the panel is longer than my cutting mat, I start from the bottom, cut, slide the panel up and then continue the cut, lining the ruler up with the bottom cut. Repeat this at every "dash". Sew a 2.5" x WOF Background strip to each of these and then sew these all together, making sure to alternate a Background strip with the "sprinkles". Add the leftover background strips as a border. These will need to be pieced together to fit the sides of the quilt. Fabrics used in this tutorial are Kona Snow and Kona Tiger Lily. For the gray version, I used 11 different "feature" fabrics and alternated the placement of the strips in the last step so that the "sprinkles" are more varied. Here is a black and white version I made, stopping just before the last cut through the "dashes" and then adding all the leftover strips as borders. If you make a quilt using this tutorial, I would love to see it. Tag me with @mandyandydesigns on instagram or send me an email. If you have any issues making this quilt or any suggestions, please feel free to contact me.